Stainless overbraid is the least expensive way to finish off any custom engine modifiction. The overbraid fits over existing hoses, and gives the look of the expensive line. It also works ideally with ECON-O-FIT hose ends for the finished appearance of professional plumbing. It´s also excellent for covering individual wires and cables and for containment of wire bundles. Real stainless steel, no plastic! Available in different diameters, sold by meter. ECON-O-FIT™ is the original anodised aluminium hose clamp cover. Its specially designed interior grooving prevents the hose from “hanging up” on the clamp and ensures proper placement of the worm-gear-type clamp with respect to the end of the hose. Fitment is always for original hose diameter without overbraid! 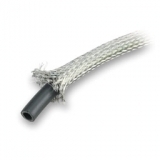 Stainless Steel Overbraid for 1/4" - 5/8"
Stainless Steel Overbraid for 1/2" - 3/4"
Stainless Steel Overbraid for 3/4" - 1 1/2"
Stainless Steel Overbraid for 1 1/2" - 2 1/4"
for hose diameter: 7/16" - 1/2"